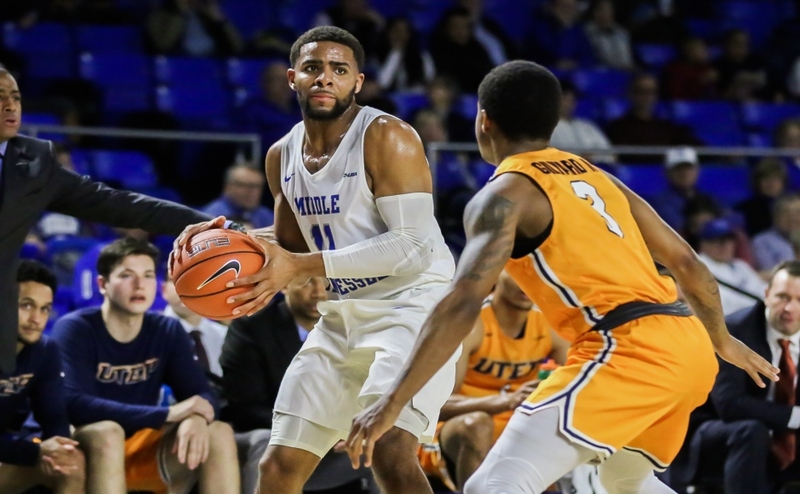 For the second time this season, the Middle Tennessee Blue Raiders (22-5, 14-1) defeated the Louisiana Tech Bulldogs (16-12, 7-8) by a score of 87-70. The win was also Kermit Davis‘ 400th Division I win of his career. This was the 12th true road victory for the Blue Raiders, and is their second this week after defeating Southern Miss on Thursday night. Much like the first meeting between MTSU and LA Tech, the game was dominated on the defensive end and the boards. LA Tech hung around with the Blue Raiders and kept it competitive early, getting as close as two points by a score of 14-12 after Jacobi Boykins connected on a three-point jumper with 14:12 left in the opening half. After the three, Middle proceeded to go on a run and create separation. 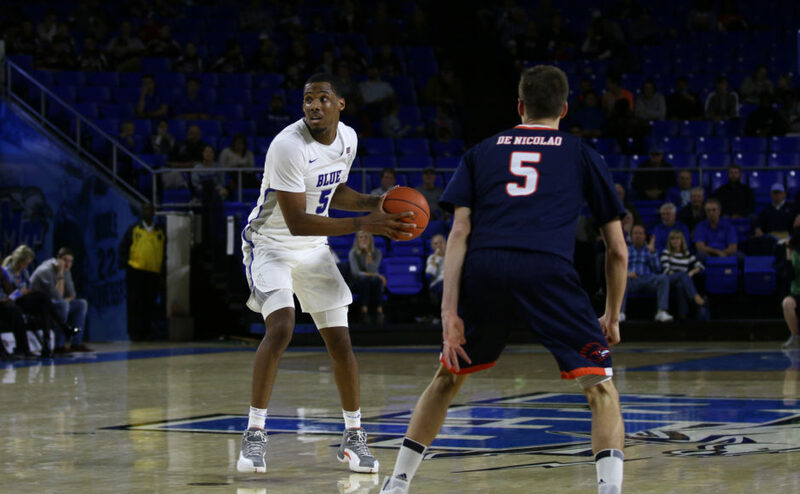 Led by senior forward Nick King, the Blue Raiders embarked on a 14-5 run that was capped off by senior Ed Simpson’s three-pointer to give MT a 28-17 lead. The run didn’t phase LA Tech, however, as they climbed right back into contention with a 16-8 run of their own to cut the Blue Raider lead to three points. 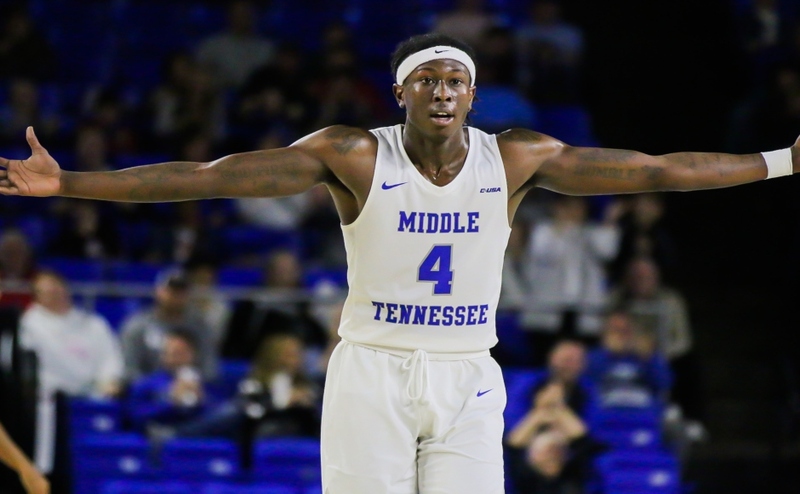 Middle Tennessee managed to extend their lead before the half, as senior Giddy Potts made a three with eight seconds remaining in the half to send the road team to the locker room with a 39-33 lead. The first five minutes of the second half were dominated by the Blue Raiders. They couldn’t seem to miss a shot, and a Donovan Sims three-pointer finished off an 18-3 scoring run. This gave Middle Tennessee a 57-36 lead. Just like they did in the first half, the Bulldogs responded to the run with one of their own. LA Tech quickly transformed a 21-point deficit into six points after a ferocious 27-12 scoring run. Leading 69-63, King took over. An old-fashioned, three-point play by King sparked the games final scoring run, this time, by the first place Blue Raiders. MT finished the game on an 18-7 scoring run during the game’s final seven minutes to complete the 87-70 victory. King is already the odds-on favorite to win the C-USA Player of the Year award, and on Saturday, he made the distinction a little more clear. Not only does King’s 25-point, 10-rebound and 4-6 shooting from beyond the arc performance further prove why he is the conference’s best player, but it inches him closer to one of the greatest individual seasons in program history. King is 69 points away from the school record in points in a season (held by Kim Cooksey in the 1985-1986 season). He also has already tied the career record for 30-point games at MTSU, and he is also getting it done on the rebounding end. Saturday night was his 10th double-double of the season, which is his third in a row. One of the givens in MTSU basketball is that King will get his points. On a nightly basis however, it is always a question of who will step up and take the pressure off of him. On Saturday night, it was junior Antwain Johnson and senior Brandon Walters. Johnson has settled in nicely to his new role as a starting guard, putting up 18 points on 5-10 shooting from the field and 4-6 from beyond the arc. On the other hand, Walters had an excellent overall game despite battling foul trouble once again. In only 18 minutes of action, Walters recorded 11 points on 3-6 shooting with 11 rebounds. The double-double for Walters is his second of the season. The Blue Raiders will return home next Saturday as they will face the University of Alabama-Birmingham Blazers (17-11, 8-7) at Murphy Center. 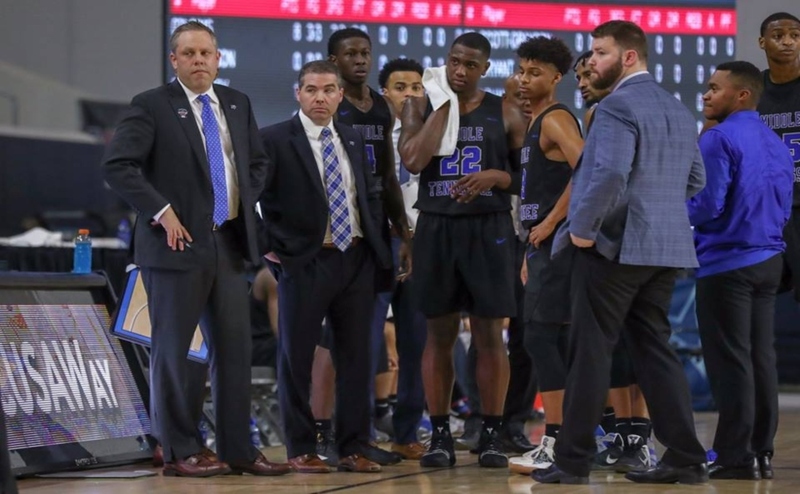 The Middle Tennessee State men’s basketball team has had another great year under Head Coach Kermit Davis. The blue raiders looked good again as they defeated the Louisiana Tech Bulldogs to complete the sweep for the season. There are three big storylines that can be taken away from this game. First, Kermit Davis tallied his 400th Division I win of his career. Davis has been coaching at MTSU for 16 years and this is a great accomplish for a great coach. Winning games is not easy in athletic profession at any level. The amount of success that he has had at MTSU any coach would trade resumes right now especially mid major coaches. Secondly, Nick King continues to produce for the Blue Raiders. In the game against La Tech King put up 25 points and 10 rebounds and was 4-6 from three-point range. King is definitely putting himself in position to win Conference USA player of the year. 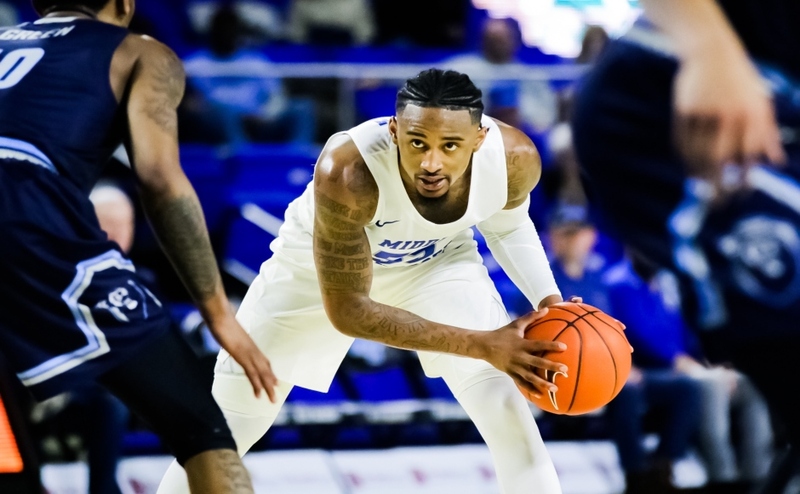 The guy has been getting it done all year and if MTSU wants to win the conference and advance in the NCAA tournament he’ll have to continue to play at a high level. And lastly, the men’s team became ranked in the Associated Press’ Top 25 rankings for the first time in school history after the win. The Blue Raiders became the 24th ranked team in the nation and the buzz around campus has been crazy. The campus is excited to see what the year’s team can accomplish and I can’t wait either.